Ever since its launch, media in India has been singing praises of Xiaomi’s latest 55 inches 4k TV, thereby, piquing people's curiosity in it. I have been flooded with queries from people wanting to know, which out of Mi 55-inch 4k TV and Vu 55-inch 4k TV would be a better choice for them, so aroused the need to come up with this piece of writing. Considering the dirt cheap price, at which Xiaomi has launched its 55-inch TV, prima facie, the deal appears highly lucrative. The reality why they are able to sell this TV at this low price dawns on us only when we delve into the technical specifications of this TV. Xiaomi has used Edge-lit backlighting (ELED) in its TV. Edge LEDs use an array of LED backlights along the outer edges of the screen that use lightguides or diffusers to fire light across into the centre of the screen. This technology allows the designing and manufacturing of exceptionally thin TV sets. Edge-lit sets also have a cost-benefit as fewer LEDs are used in them, because of which, they are power efficient too. However, technically speaking, Edge-lit backlighting is the least effective system in terms of achieving a high contrast ratio as it does not offer ‘local dimming’. The black levels are not as deep and the edge area of the screen has a tendency to be brighter than the centre area of the screen. The Edge TVs not only struggle to produce a high contrast, they can also get affected by Murra Effect, which can cause light to bleed from sides to gradually overpower the entire screen. On the other hand, Vu TV LTDN55XT780XWAU3D_HDR has employed DLED backlighting in its TV. In this technology, several rows of LEDs are placed behind the entire surface of the screen. As the LEDs are behind the LCD panel in DLED TVs, dual modulation works far more efficiently and the TVs can have better overall brightness and contrast. Using a feature called local dimming, the LEDs are divided into a number of zones that can be individually controlled, so some portions of the backlight can be dimmed or switched-off while others remain illuminated. Direct-lit LEDs can have more than 200 LED lights arranged all over the screen in clusters. It is visually the most impressive technology, though it’s more expensive and adds extra millimetres to the depth of the TV. DLED TVs have local dimming that improves the blackness of an image and produces best in class picture quality, with an exceptional contrast ratio of up to 10,000,000:1. They have the ability to implement new levels of peak light output and give superb motion reproduction too. Some EDGE LEDs also stake claim to local dimming, but in these TVs, it is hardly able to bring the desired effect. Though different brand TVs might be using the same DLED or ELED backlighting, their image quality might differ considerably depending on how many lights are used and how they are aligned. In some budget Edge-lit TVs, LEDs are aligned on only one side, either upper or lower edge of the TV panel, while others might have LEDs on both upper and lower edges of the panel. The high end Edge-lit TVs might even have a row of LEDs on all four edges of the panel. Some manufacturers use both Edge and Direct LED systems for LCD TVs. The best professional monitors use direct LEDs. Though bigger brands like Sony, Samsung and LG also prefer EDGE-lit LED backlighting in their TVs, they complement it with some of their indigenously formulated technology to enhance the picture quality. As ELED TVs can be manufactured at a lesser cost, TV manufacturers are resorting to this technology to lure people with an ultra-affordable price tag along with its ultra-slim design. No doubt, Mi is far better than Vu in looks, it has chosen the cost-effective ELED technology in its TV because of which it is able to launch its TV at a much lesser price. But then, these ELED TVs are marred by many lacunae and lack local dimming that grace the picture quality with a perfectness required to make a TV flawless. Being ultra-slim does not mean that the TV is just perfect and has durability too. The bezel-less display of Mi TV, though in design, is one of the ultimate, is fragile and unpredictable as LCD comprises multiple layers and binding them together with adequate pressure is the guarantee to its good picture quality in long-term. No doubt, prima facie the picture quality is one of the best in the budget offerings, its hardware and bezel-less ultra-slim design does put a big question mark on its durability and performance in long run. On the other hand, this Vu 55 inches 4k TV comes with a DLED technology, therefore its higher price tag than its counterpart Mi TV is justified. The technology used in this Vu TV graces it with local dimming, which translates to a much better contrast and brightness as these sets have the ability to implement new levels of peak light output. 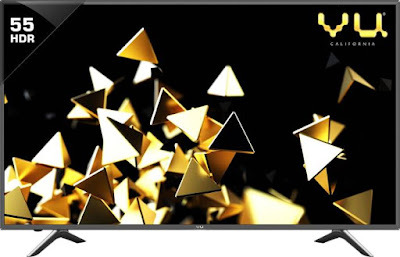 Despite a standard refresh rate of 50 Hz, these DLED Vu TVs have the capability of better motion reproduction, and then, Vu also comes with Ultra Smooth Motion technology. The Pixelight HDR 10 technology in Vu, too, works in cohesion with local dimming to augment its picture quality. The Bluetooth connectivity option with which Xiaomi has graced its Mi TV 4 is certainly laudable, on the other hand, Vu TV draws much flak for evading this indispensable feature in its TV. 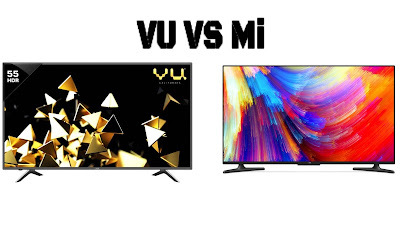 The sound quality of Vu 55 inches TV is better than the Mi TV as it has 24 Watts speaker output, whereas, Mi has only 16 Watts output. In connectivity, too, Vu beats Mi as it has 3 USB and 4 HDMI ports, whereas Mi has only 2 USB and 3 HDMI ports. On the other hand, Mi beats Vu in having Android-based Amlogic 64-bit Quad-core processor that has been integrated with Mali-T830 MP2 graphics and comes with 2 GB RAM along with 8 GB Storage, whereas, Vu is not android-based. As of now, the smartness of Xiaomi TV, too, seems lacklustre. It is a great let down for the Mi TV that it has no official access to Google Play Store, Netflix, Amazon Prime videos and above all YouTube, which are very much sought after media platforms. The Patchwall UI is more of a gimmick, which might be confusing to some. At least, we get Netflix and YouTube officially on the Vu TV. Nonetheless, it is not denying the fact that the middle class who was unable to afford a 4k 55 inches’ big screen TV have now, a good option to go with, in form of this TV. We also do acknowledge the fact, that Xiaomi has kept its profit margin considerably low to disrupt the Indian television market and carve here a niche of its own. This would be too early a stage to predict the durability of this TV. We still need time to see the effective results of the ultra-slim bezel-less design with which Xiaomi has experimented in this 55 inches Mi 4k TV4. As of now, Mi TV 4 is undisputedly the best option available in the budget TV categories. Considering the dirt cheap price at which it has been made available by Xiaomi, comparing its performance with big brand TVs would be unfair as it is being sold at 1/5th of their price. Vu, too, which had the best picture quality not only in budget TVs, but had been giving a tough competition to big brands, is also dearer by 13k. So, in its category, Mi TV is certainly the sole bet for the best performance. 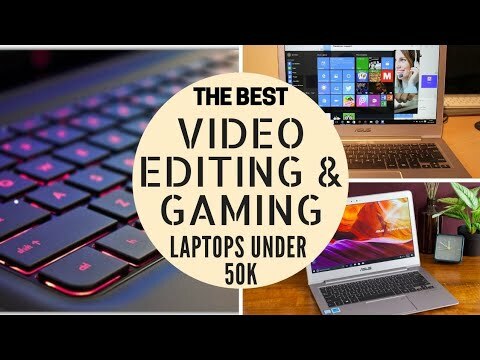 If your budget is limited, go for Mi, but if you can afford Vu, it is a better option. Not only does it come with DLED backlighting that translates into better picture quality, but we have seen them faring well for quite some time now. Nice article and video. The question remains...Which is the best PQ, VFM non-smart(or less smart) TV 55" or more with HDR10 or Dolby Vision (1000+ Nits)? As you have mentioned, I do have a fantastic android box and a sound bar.If it is Vu, which model? Slim or fat is ok.
Just do not buy TV from Vu or any other budget brand offering ELED model. ELED TVs of bigger brands like Sony are much better and safer as they support the ELED backlight with some of their own technology, so that defects of ELED do not get evident. Though picture quality of Vu ELED TVs is pretty good, they get marred by Mura effect after some time. Prefer DLED TVs over ELED. HDR 10 in budget offerings lack in one point or the other, only big brands grace their upper models with perfect HDR 10, but then they cost a fortune!